David Rosenberg spoke with Bloomberg this week in the video below discussing the Fed's decision tomorrow on QE3. He also reviews financial repression; the cost to savers of an endless period of zero interest rate policy. 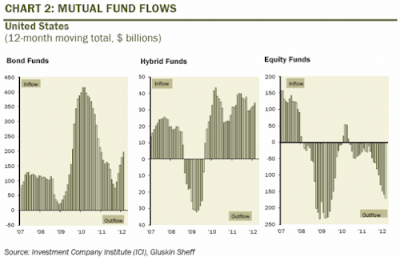 Rosie also posted a great chart last week in one of his articles showing the mutual fund flows since 2007. 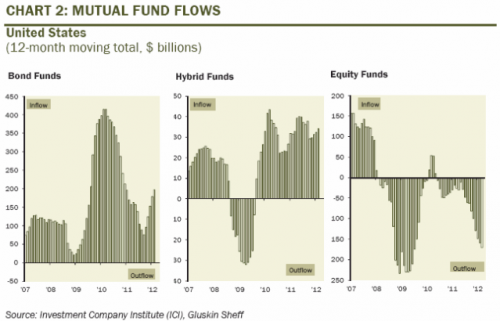 The flow has been steady; out of stock funds into hybrid funds (bonds and stocks) and bond only funds. Mutual funds provide a great look at what the "average" investor is doing with their money (this tracks 401k funds). It shows that the general public has once again position themselves perfectly for maximum disaster when the bond bubble implodes. Marc Faber: Fed Policy Will "Destroy The World"